This Tuesday, August 15, the public will have an opportunity to learn about and provide input on the latest designs and dirt-trucking plans for trails, pond enhancements levee work and wetlands restoration at the Alviso and Ravenswood ponds. The meeting of the Project’s Stakeholder Forum and Working Groups will run from 1-4 p.m. at the Don Edwards San Francisco Bay National Wildlife Refuge Headquarters in Fremont, in the 3rd floor auditorium. All interested stakeholders, agency representatives, and members of the public are invited to attend. Guest presentations on the Measure AA parcel tax raising money for the Bay and the Resilience by Design Challenge, which will involve designers and communities developing innovative Bay sea level rise protection strategies. The meeting will be preceded by a late morning tour of the Eden Landing Ecological Reserve, where the California Department of Fish and Wildlife has opened new trails, a kayak launch, a saltworks-viewing boardwalk and enhanced shorebird ponds. The tour will take place from 10:30 a.m. to 12:30 p.m., meeting at the Hayward reserve parking lot near the corner of Eden Landing and Arden roads. The draft environmental analysis report on alternatives for Eden Landing Phase 2 restoration, trails, habitat enhancement and flood management is expected to be released in late summer or early fall. The Project will schedule a public hearing on the draft document as soon as a publication date is firm. Project managers had scheduled a meeting for mid-August, but postponed the event after learning that the timing of administrative processes for the combined state and federal environmental document remains uncertain. Eden Landing Phase 2 focuses on all ponds between Old Alameda Creek and the Alameda County Flood Control Channel in the State Department of Fish and Wildlife reserve. Alternatives include extensive wetlands restoration, either full or phased, as well as an alternative retaining a portion of the acreage as managed ponds. The alternatives also include various approaches to enhancing levees, and a number of options for new trails. To review maps and a 2016 presentation on Phase 2 alternatives, as well as other Phase 2 information, click here. 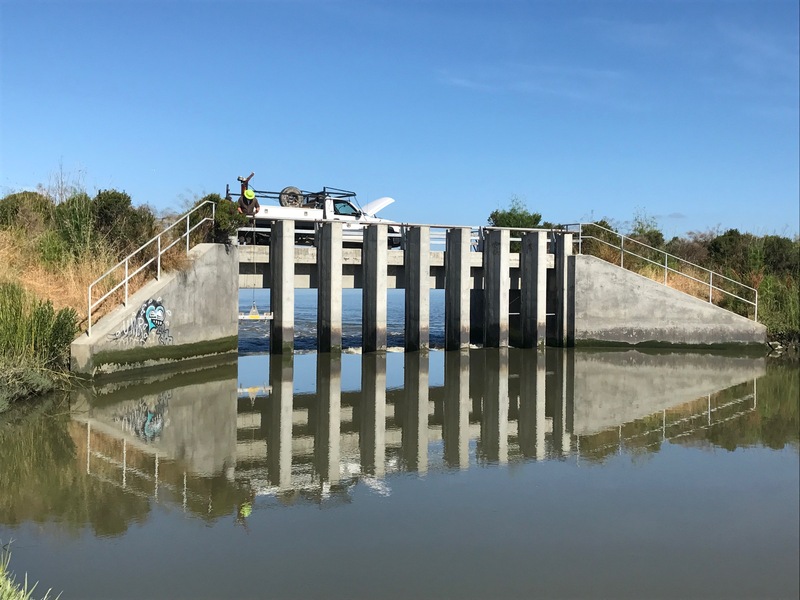 After getting a regulatory okay, the Refuge in early June fully opened all of the gates separating Alviso Pond A8 from the Bay for the first time. This brings the pond and its connected neighbors, Pond A5 and A7, one step closer to full tidal restoration, our ultimate goal. Bay waters can now flow in more strongly, bringing in mud to create the foundation for wetlands. The Restoration Project in 2010 built a dam with eight separate gates at Pond A8, so we could carefully control water flows in and out of the mercury-laden pond. We opened the first gate six years ago, with many studies to see how the change impacted mercury levels in water, sediment, bird eggs and fish. In addition, we needed to observe steelhead, with regulators concerned they might swim into the pond and be trapped. Research to date found no trapped steelhead. Mercury studies, which will continue, have shown a short-term mercury spike upon first opening the pond, but no long-term impacts. Endangered least terns and chicks at Eden Landing! 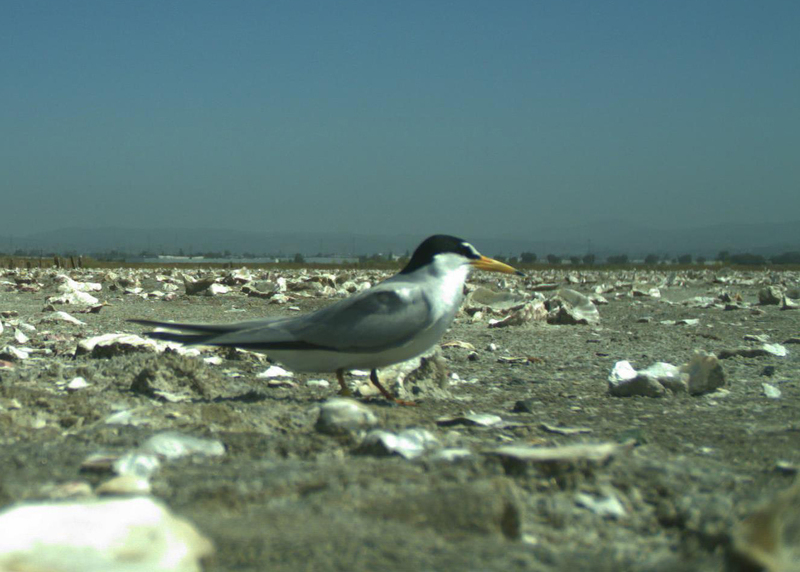 For the first time in seven years, federally endangered California least terns have nested and hatched chicks at Eden Landing. San Francisco Bay Bird Observatory nest cameras, designed to monitor another listed species, western snowy plovers, have picked up shots of the parents and some fuzzy pictures of the chicks. SFBBO first saw multiple least tern nests at the State Department of Fish and Wildlife reserve near Hayward in early June. It's been 7 years since the terns have tried to nest there, and at that time, all young were predated. The birds nested amid oyster shells scattered to provide camouflage for nesting plovers and their chicks. The Restoration Project is benefiting from the work of two temporary employees, and the US Fish and Wildlife Service welcomes a new manager of the Don Edwards Refuge. We are getting some help from the Project’s first lead scientist, Lynne Trulio, who is serving as Interim Lead Scientist until January during her sabbatical from San Jose State University. Lynne is stepping in after the departure of previous Lead Scientist Laura Valoppi, who has taken a position dealing with Delta science. Also here until January is David Halsing, serving as Deputy Project Manager, where he backstops Executive Project Manager John Bourgeois, helping primarily with Phase 2 permitting and design work in conjunction with our consultant, AECOM. Dave previously worked at AECOM, the lead consultant firm on Phase 2 planning. 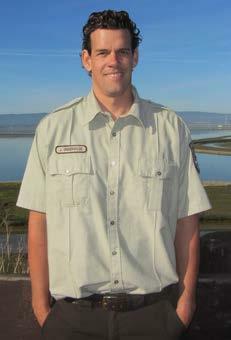 Dr. Jared Underwood arrived at the Refuge Complex in March 2017 to take the helm of Don Edwards San Francisco Bay National Wildlife Refuge. Learn more about Jared in this Q & A session with Visitor Services Intern Jacquelyn Warren. A: I am originally from Los Angeles, but I moved to Hawaii when I was 12. Q: What field of study did you earn your Ph.D. in? A: I earned my Ph.D. in conservation biology at Arizona State University. For my dissertation, I worked in conservation planning and reserve design, which is a process of identifying and prioritizing areas for habitat protection. I also earned my bachelor’s and master’s degrees in conservation biology at Brigham Young University in Utah. For my master’s project, I studied the migration of hawks in western North America. This research consisted of capturing hawks and placing satellite transmitters on their backs to track their movement. Q: What inspired you to choose this career field? A: I would have to say that being exposed to nature at a young age by my parents led to my interest in the wildlife and the outdoors. My environment also played a large role. Growing up in Hawaii I learned a lot about threatened and endangered species. It was my interest in saving them that led me towards majoring in conservation biology for both my undergraduate and graduate studies. A: I worked with the U.S. Fish & Wildlife Service where I managed the inventory and monitoring program for the Hawaiian and Pacific Islands. This job encompassed 22 refuges which spread from Japan down to Samoa. I also managed a complex of five refuges on three different islands for a year while I was there. It was that year of work that sparked my interest in becoming a manager. I also developed an interest in public education as several of these refuges were semi-urban. Q: Why Don Edwards San Francisco Bay National Wildlife Refuge? A: One of the reasons I was excited to come work here at Don Edwards was because it still has that endangered species focus. It also has great restoration projects specifically for the endangered species that we have here on the Refuge. The large restoration project of the South Bay was also of interest to me. As part of my last job, I worked on the landscape level which I really preferred over working on smaller projects. I personally believe these larger restoration projects are more impactful. I also really like the environmental education program that Don Edwards has. Public engagement is very important to me since my wildlife experiences I had as a child led me to where I am today. Q: What were your first impressions of the Bay Area? A: The beautiful green hills and how friendly everyone is at the Refuge. Also, the cultural diversity we have here, which reminds me of home. I was also struck by the natural beauty of the area despite the urban setting. And, of course, the passion that a lot of locals seem to have for the environment. Q: What experiences are you hoping to gain/accomplish that you couldn’t at your other job? A: Well, by working at Don Edwards, I will have the ability to work in an urban refuge environment giving me more opportunity to interact with the public. I will also have the chance to work on our large scale restoration projects and with the Warm Springs Unit. Jared enjoys hiking, birding, and all water-related activities such as surfing, snorkeling, scuba diving and kayaking. He is married with four children ages 18 months to 11 years old. Bald eagles have nested and fledged a chick in Milpitas near the Island Ponds, and have been seen catching fish at Pond A19. 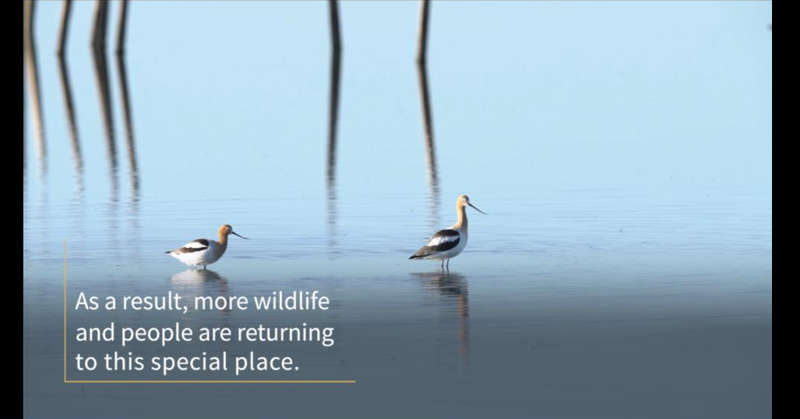 The wetlands restoration has enhanced populations of South Bay fish, a preferred food of the birds. The pair set up house this winter at the top of a redwood tree on the front lawn of Curtner Elementary School, where they have become minor celebrities. Their eaglet was beginning to fly last month. 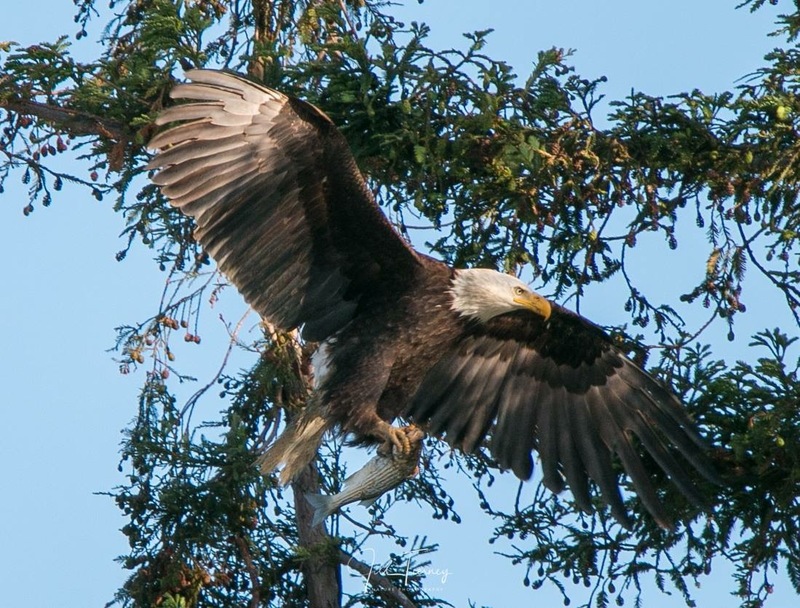 Bald eagles were one of the species decimated by the use of DDT. For more on that history and the recent Bay Area eagle population boom, see the San Jose Mercury News article here. Eden Landing is the subject of the latest San Francisco Bay Joint Venture video short on wetlands restoration success in the Bay Area. You can see it on our video page here. The series, Wetland Restoration Is Working, is produced by videographers TrimTab Media and funded by Ducks Unlimited and the Wildlife Conservation Board. A wide-ranging National Geographic website article on tidal restoration around San Francisco Bay includes our work at Eden Landing and Ravenswood ponds. In the piece, longtime Bay Area journalist Jane Kay, who spent a year visiting Bay edges in all nine Bay Area counties, offers a historical perspective on the changes she has seen over the decades. Article. 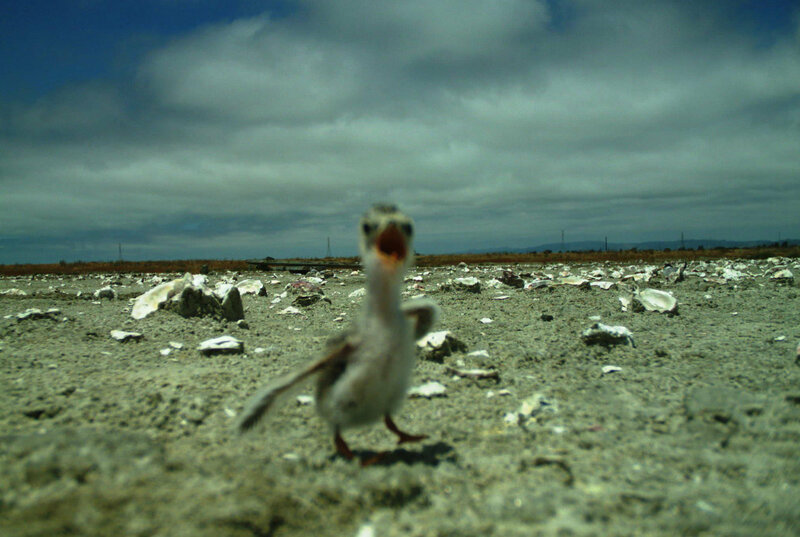 The SF Estuary Partnership’s Estuary News feature story on the Refuge’s Caspian tern decoy project, including a video of a chirping chick in an egg: Article. The Almanac details our Phase 2 plans for the Ravenswood area: Article. 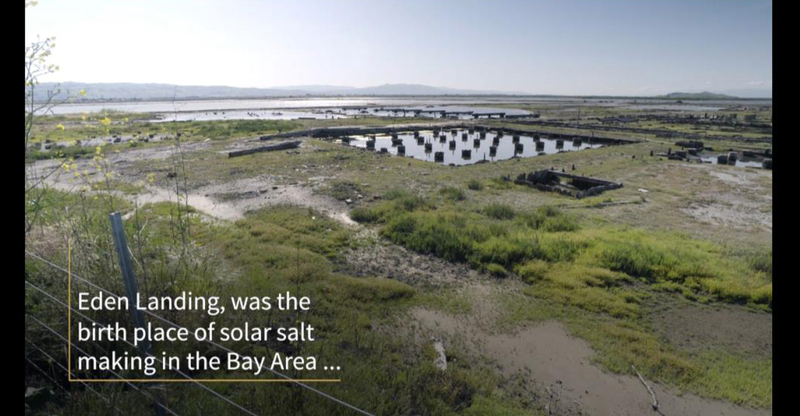 UC Berkeley’s KALW Radio talks with kite photographer Cris Benton (Emeritus Professor of architecture there) and Refuge biologist Cheryl Strong and discusses why losing the brilliant colors of industrial salt ponds to natural hues signals a positive for nature: Article and Podcast. A Stanford University take on Measure AA and continued funding needs for wetlands: Article and Podcast. and from KTVU TV: Article and Video. More events are listed on the Events and Meetings section of the project web site. All stakeholders and members of the public are invited to our periodic update meeting, to learn about and share your views on the restoration. This year, the day’s events will begin with a 10:30 a.m. walking tour of new Eden Landing public access features (kayak launch, historic site boardwalk, trail) and bird pond enhancements. 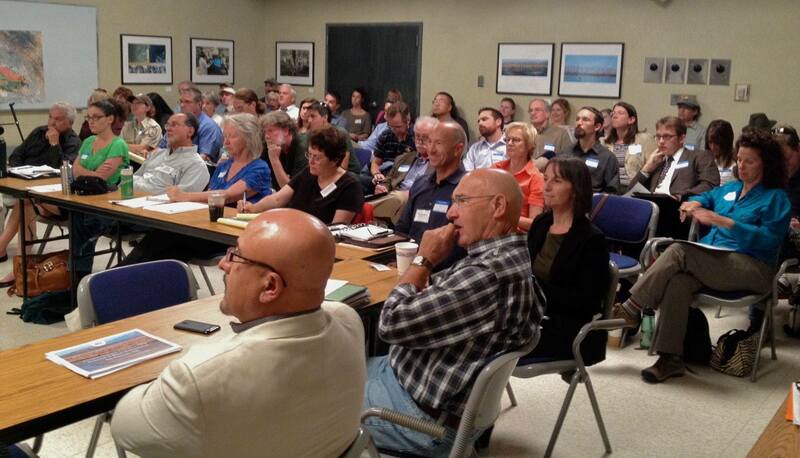 At 1 p.m. we will convene at the Refuge headquarters in Fremont to discuss the latest designs and fill trucking plans for Alviso and Ravenswood habitat, trail and flood projects; upland transition habitat plans; an update on Eden Landing planning; science news; Shoreline Study update; and guest presentations on the Resilient by Design Challenge for innovative sea level rise protection designs, and on Measure AA funding for the Bay. For directions and detailed information, see the Project website Stakeholder Forum Meetings page. Our refuge consists of salt marshes, salt ponds, tidal and non-tidal sloughs. How do humans and wildlife depend on our wetlands? 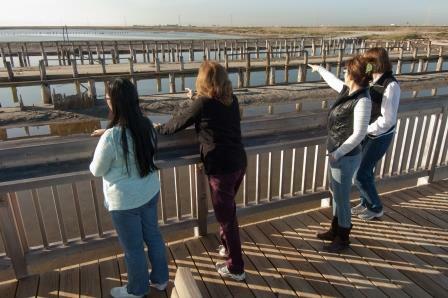 Come enjoy a 0.5 mile walk through the wetlands, while be depict the life and death struggles of our marsh inhabitants. Open to all ages but best suited for ages 7 and up. Register here. Photo Credits: Eagle: Jill Tierney of California Birding; Eden Landing visitors: Judy Irving; Least tern camera shots courtesy of San Francisco Bay Bird Observatory. Facebook and Twitter Users Can Follow the Salt Pond Restoration! 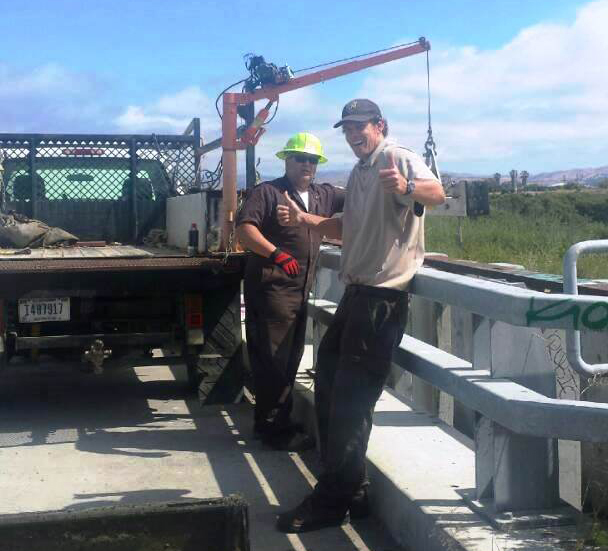 Want to receive regular updates, interesting trivia and the latest pictures and videos about the South Bay Salt Pond Restoration? View a complete list of our partners, major donors and participants.